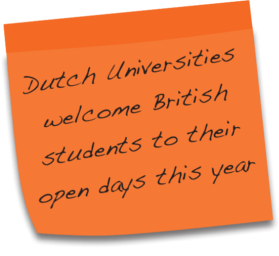 Dutch universities welcome British students, parents and advisors to their open days. If you are thinking about studying at a Dutch university 2013 or beyond, there is no better way to find out more than to see for yourself. Click on the university name to find out which courses they offer in English, then request information on those which are interesting to you. We will then make sure you receive all the details you need to start planning your trip!